Cloud service provider Backblaze has published performance and reliability data on two of the industry's leading 6TB 3.5-in. 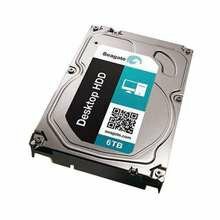 hard drives from Seagate and Western Digital (WD). The result? The Seagate Barracuda desktop hard drive (model STBD6000100) was outperformed by WD's Red SATA NAS drives (model WD60EFRX). Seagate's drive also uses a little more electricity. The good news is that both drive arrays -- one using WD drives, the other Seagate drives -- sustained more than 136TB of writes without a single drive failure or data error recorded. Backblaze calls its drive arrays "Storage Pods." Newly installed Storage Pods accept data for the most part unencumbered until they reach 80% capacity. At that point, a Storage Pod will reduce the amount of data it receives each day. New Storage Pods come on line on a regular basis so that arriving data always has a place to go without delay. What's a bit odd about this test bed is that Backblaze chose a WD NAS (network-attached storage) drive with a 5400rpm spindle speed to compete against a Seagate desktop drive with a 7200rpm spindle speed. The different speeds account for the disparity in power use, but not necessarily performance. Both models cost about the same and use 6Gbps SATA connectors. "We almost never use 'enterprise' drives in our Storage Pods because they tend to cost 2x more… and the increased reliability (which is questionable)… doesn’t justify the cost," Backblaze CEO Gleb Budman said via email to Computerworld. "The 6TB drives are both 'consumer' drives. The WDs are 'NAS' drives, but technically still consumer. We prefer to purchase 5400RPM drives when possible, since they’re most power efficient. However, the Seagate 6TB drives don’t come in a 5400RPM version." Even so, WD drives at the 5400rpm speed were able to write data faster than the 7200rpm Seagate drives. Backblaze performed the test, it said, because over the next several months it plans on transitioning from 4TB hard drives to the higher-capacity models. "With over 10,000 hard drives needing to be purchased over the next several months, the choice of which 6TB hard drive to use is critical," Andy Klein, director of product marketing at Backblaze, wrote in a blog post . Based on the results, Backblaze said it has ordered 230 WD 6TB drives to fill 5 Storage Pods. "Assuming the Western Digital drives continue to perform as well in the 5 Storage Pods, we'll move forward with using the Western Digital 6TB drives in our Storage Pods over the coming months," Klein wrote. To perform the test, Backblaze deployed two "Storage Pods" (the term it uses for self-contained storage arrays), each with 45 drives from Seagate and WD. The Western Digital Storage Pod was designated UL796 and the Seagate Storage Pod was designated UL800. Each Pod was identical in design and configuration except for the hard drives used. A graph showing data stored each day to the various Storage Pods. 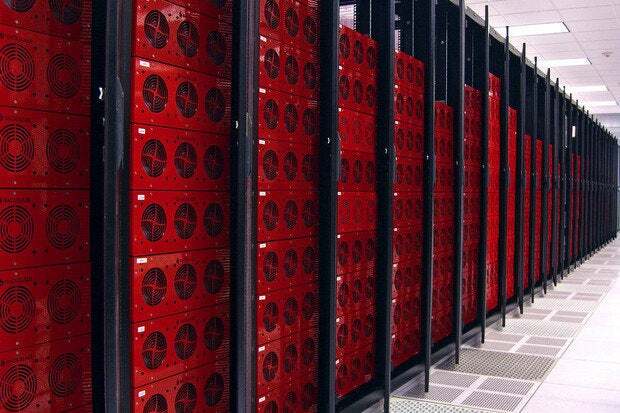 Backblaze currently receives 130TB of data from its customers to store each day. Data arrives in similarly sized encrypted blocks. On any given day, 20 to 40 Storage Pods accept these data blocks as they arrive. As a block arrives, it is passed to a Storage Pod; if that Pod is busy, the data block is passed to the next Pod in line. Over the course of each day, this results in all the available Storage Pods being given the same opportunity to accept data at the same rate. Backblaze claims the WD drives arrays were able to edge out the arrays filled with Seagate drives by a little over 1 TB per of I/O performance per day, on average. For example, the WD Pod loaded 5.12TB of data per day and Seagate's loaded 4.02TB per day. 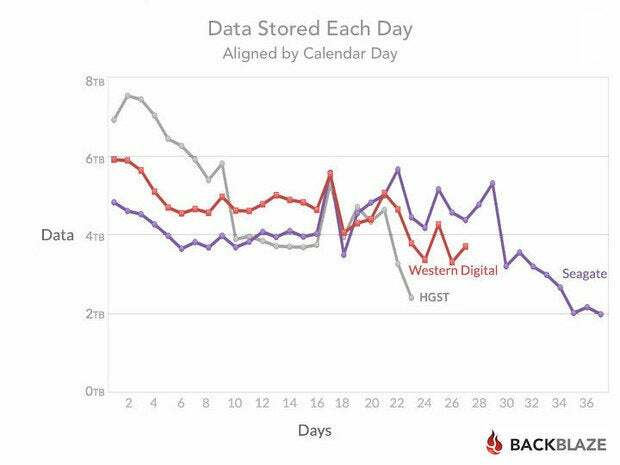 For comparison purposes, Backblaze said it also deployed a Storage Pod filled with 4TB drives from HGST. Last year, Backblaze began publishing hard drive study data, all of it culled from its massive data center containing nearly 40,000 hard drives. It has reported mostly on reliability. Most recently, though, it released data about which five of the 70 metrics that SMART stats cover are likely to predict a hard drive failure. The report this past September claimed to show consumer hard drives were as reliable as enterprise-class models, if not more so.